US-Turkish relations have been strained by US support for the Kurdish YPG, which Turkey views as a terrorist group and an extension of the outlawed Kurdistan Workers Party (PKK) that has for decades waged a separatist insurgency in Turkey. Istanbul, Riyadh: The United States and Turkey sparred on Monday over the fate of US-allied Kurdish fighters in Syria, with Washington insisting they not be harmed and Ankara rejecting a perceived US threat to punish Turkey economically if it attacked them. The disagreement, played out in rival tweets, is the latest consequence of US President Donald Trump’s December 19 decision to withdraw US troops from Syria, potentially leaving the Kurdish militia under threat as Turkey weighs a new offensive there. The Kurdish YPG has been a US ally in the fight against the Islamic State (ISIS) jihadists and it controls swaths of northern Syria. Erdogan has vowed to crush it in the wake of Trump’s decision to pull troops out. On Sunday, Trump said the United States was starting the pull-out of US forces that were deployed to Syria to help drive Islamic State fighters out of the country but it would continue to hit the militant group if need be. “Will attack again from existing nearby base if it reforms. Will devastate Turkey economically if they hit Kurds. Create 20 mile safe zone … Likewise, do not want the Kurds to provoke Turkey,” Trump tweeted. 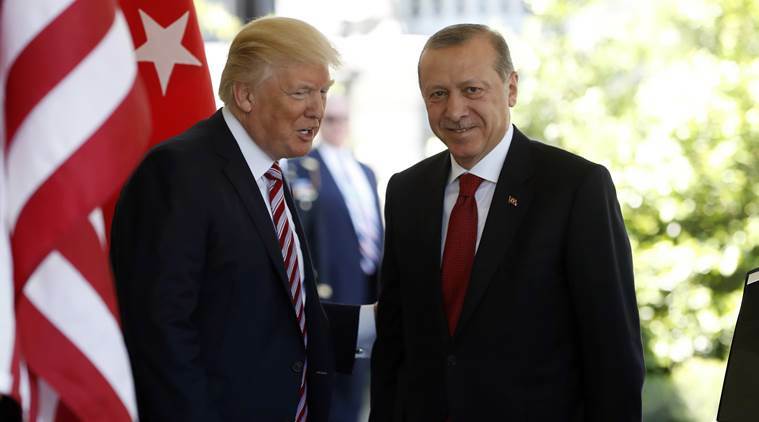 Ankara rebuked Washington for Trump’s tweet, which revived fears of a new deterioration in ties between the NATO allies. “Terrorists can’t be your partners & allies. Turkey expects the US to honor our strategic partnership and doesn’t want it to be shadowed by terrorist propaganda,” Turkish presidential spokesman Ibrahim Kalin said in a tweet. Trump and Turkish President Tayyip Erdogan spoke on Monday in what seemed an effort to quell the dispute but Washington stuck to its emphasis on protecting the Kurds, among the most effective fighters against Islamic State (ISIS) militants. “The president expressed the desire to work together to address Turkey’s security concerns in northeast Syria while stressing the importance to the United States that Turkey does not mistreat the Kurds and other Syrian Democratic Forces with whom we have fought to defeat ISIS,” White House spokeswoman Sarah Sanders said in a statement. Trump and Erdogan discussed the creation of a safe zone in northern Syria cleared of militia groups, the Turkish presidency said, without providing further detail. Both men emphasised the need to avoid letting anything block the planned withdrawal of US forces from Syria, Ankara added. Ankara is well aware of the cost of strained US ties. A diplomatic crisis last year, when Trump imposed sanctions on two of Erdogan’s ministers and raised tariffs on Turkish metal exports, helped push the Turkish lira to a record low in August. Having slid as much as 1.6 percent to 5.5450 against the dollar earlier in the day, the lira stood at 5.4401 at 1919 GMT, firming around a quarter of a percent from Friday’s close. Trump gave no details about the safe zone proposal, but Pompeo said Washington wanted to provide security for those who have fought Islamic State and to prevent any attack on Turkey from Syria. “If we can get the space and the security arrangements right it would be a good thing for everyone in the region,” he said. Turkish Foreign Minister Mevlut Cavusoglu said Ankara was not against the idea of a secure zone along the border, but said partners and allies should not communicate via social media.